A lot of times electrical damages go unnoticed, or unseen until it is too late. Electrical or lighting accidents cause damage to around 24,000 homes and led to the deaths of around 300 people. It is important that you keep electrical safety in mind to keep a safe home. Here are some signs that you may have overlooked when it comes to your electrical system is safe. If you have seen some of the signs search electrical repair Philadelphia pa to find an electrician near you. Lights draw very little energy so if they start to flicker it could be a sign of two different problems. One, something else on the same circuit is drawing energy away from the lights such as a washing machine. It could also be a sign that the wiring to the fixture has become too hot, and damaged. If a fuse trips when you plug in the vacuum cleaner the circuit breaker is more then likely just doing its job of keeping the system overloaded. If the breaker flips, or you’re having to change fuses often from just day to day use, then there could be a problem with your circuit. You could be using more electricity than the house is designed to use. Electricity should not make a sound. If you hear a buzzing or popping sound coming from an outlet stop using immediately. It is the sound of the current jumping from connections instead of flowing smoothly. It could be a sign of damaged wires or prongs. If you smell something burning like plastic. You can’t tell where it is coming from it is important that you call an electrician to check your wiring. If you detect a smell coming from an outlet, stop using it. If you plug something in and it starts to spark it could be the appliance. 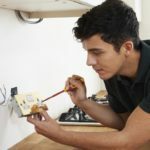 If you see the sparking coming from the fuse box or an outlet, then you need to call an electrician as soon as possible. It can be dangerous and start a fire. Sometimes appliances get hot if they are plugged in for a while. Electrical outlets and light switches should never get hot. If the outlet has a burned or scorched appearance, then something is wrong with the wiring. Extension cords can shot out a circuit system if they get overloaded. The cords also create weak spots, since the cords can kink, get tripped over, or short out. The cord can lead to a damaged outlet, or even cause a fire. If you have to use extension cords frequently then its time to update the wiring in the house. Kitchen and bathroom outlets have to have a special outlet called ground fault circuity interpreters. Since these areas use water, they need outlets that are shock resistant. If your outlets look the same in the kitchen as they do in the bedroom, you may need to change them.